Key features: Effectively kills all intestinal worms including roundworm, hookworm, caecal worm, thread worm, and tapeworm. 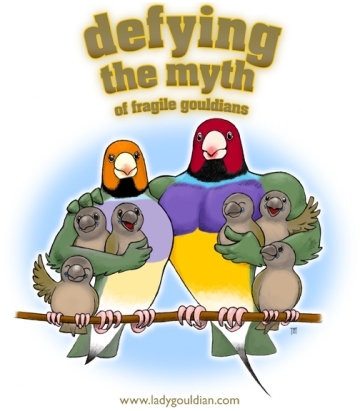 Completely safe and can be mixed with a small amount of orange juice for fussy drinkers. Directions: I have found that when administering the Worm Out Gel in the drinking water, it will dissolve best if you heat 1/3 of the required water in a microwave. Dissolve the WOG in that heated water and then add the additional 2/3 needed cool water to the required volume. 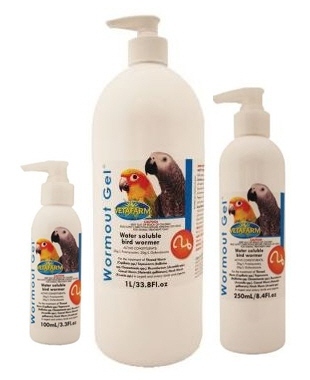 All aviary birds - Add 2mL of Wormout Gel to 160mL (2/3 US cup) of drinking water. Pigeons - Add 2mL of Wormout Gel to 320mL (1 1/3 US cup) of drinking water. Crop Needle Dose: Use a small syringe for accurate dosing. Carefully dilute 1mL of Wormout Gel in 9mLs (1tsp in 9tsp) of water to make a ‘stock solution’, shake this mixture well. Give 0.5mL (0.5cc) of stock solution per 100g (3.5oz) body weight; administer directly using a crop needle. Give treatment once only and then repeat once every 3 months.